For the majority of the time my chef/husband has worked in a professional kitchen, he’s worked on the weekends. With some jobs he has had Sunday off or at least Sunday morning off so he could go to church. But other than that, if it was a Friday, Saturday or Sunday, he was at work. No questions asked. 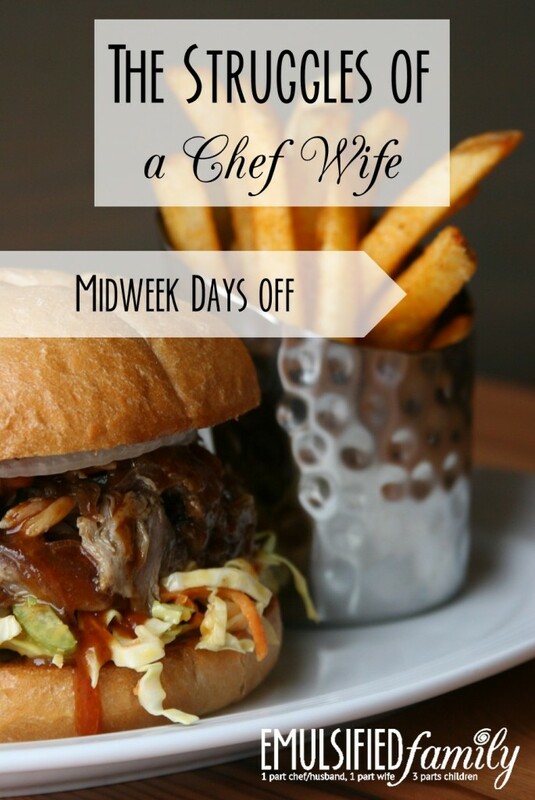 I used to really struggle with my chef/husband having weekdays off. When I worked full time, there was not one entire day when we were both off. Friday and Saturdays were supposed to be date nights, right? Not Monday or Tuesday. After all, that’s when all my friends were going out! Events with family and friends were always on the weekend, which meant I was going to them alone. Getting together with friends was difficult because having someone over for dinner on a Monday or Tuesday, when they worked a traditional schedule, isn’t always possible. Over the years, I eventually got used to it and didn’t mind it any more. I wish I had some great piece of advice to give you if you are struggling with this. But really, it’s just best to embrace it and make the best of it. Because guess what?????? Having my chef off on the weekend isn’t AT ALL what I thought it would be. A few months ago my husband moved into a corporate position and many of the things I knew to be true as a chef wife changed. Who knows how long it will be for, but for now with my husband’s current job, he’s off on weekends. So this is what it feels like to have “normal” days off. Now wait! Before you start to get jealous . . . I’ll be honest with you, it’s not exactly what I thought it would be. Having 2 days off together is really nice. This gives him a chance to get caught up on sleep and we still get to spend time with him. However, EVERYTHING is so crowded on the weekends. What in the world?? Who wants to be in the middle of downtown Seattle when it’s so crowded you can hardly walk? NOT US!! So many times we think the “grass is greener on the other side.” But in this case, I’m not sure that it is. Do you struggle with your chef having weekdays off? How have you dealt with that over the years? Let me know in the comments. Does he like having the days off broken up? It’s kind of nice knowing he only has to work a few days and then gets a break (at least that’s how I felt). Our issue isn’t him not being off on a weekend, its me. I have so much blackout days and only have one “usual” set day off. During blackout, it means we work every.single.weekend. Easter will be our first day off together in a long time! My days off are rotating when I am not in a long blackout period. Easter and Christmas are my longest blackout periods. Shannon commented above that she used to be the one working weekends as well. Interesting. I think anytime we are working opposite schedules, it’s just hard/impossible to find time to spend together. Work, kids, hobbies, etc. all take so much of our time. 🙁 And rotating days off in combination with a chef’s schedule that also tends to change sounds really tough! When I was home on maternity leave I enjoyed the fact that his days off were during the week. Pretty much for the same reasons you stated – less crowded, errands don’t take as long, etc. – the upside is that each of us get our “own” time with the kids. I for one really like this for myself. I like it for him as well, he just struggles a bit more as the girls aren’t as well behaved for him. I think in another couple of years he will enjoy it more once our youngest isn’t quite as needy (in a needs to be carried around all the time kind of way… silly babies, haha). The older one has reached an age and maturity level that makes her very easy to take out and about. – the downside is that we do not have full days off together, and with exhaustion levels running high for both of us, our time is limited in both quality and quantity. As far as weekend events go… I actually don’t mind attending most things by myself with the kids. Obviously I would prefer to have him with us but fully realize this doesn’t happen often. He has a decent amount of flexibility to request a day of for events we know about in advance but those are typically reserved for the kids’ birthdays, planned vacations, etc. I feel worse for our mutual friends and family who see him far less than I do! I agree that the Sunday-Monday off schedule is a pretty nice one. 🙂 Glad to hear your chef has some flexibility for taking days off for events!! It would be hard for Daddy to miss a birthday party!